Cross-selling is about offering your customers complementary products or related products. These are related products module are items that enhance the original product or provide additional features.Cross-selling allows more sales through complementary products and the increase through a more expensive and more profitable article for online commerce. These two different strategies share the same objective of increasing average sales. For example, in Prestashop related products when you buy an electronic device, you are advised to buy a cover or insurance for your new product. It’s cross-selling.In a car dealership the buyer must opt for a car model, once the sale is completed, if the seller offers his client insurance or a luggage rack, it is a cross sell. Cross sale: final product + complementary product. The increase in total sales is the main benefit of cross-selling is, and it is not the only one. You can also optimize costs; it is cheaper to manage a single order with several items than several orders for a single product. You will only pay shipping costs once, think about it. By anticipating the needs, your customer will be satisfied because it will add value. This can lead to greater brand loyalty.You will know your audience better because with each sale you will be able to analyze with greater precision how your customers behave. You can implement a finer and more efficient strategy, which will result in more sales. 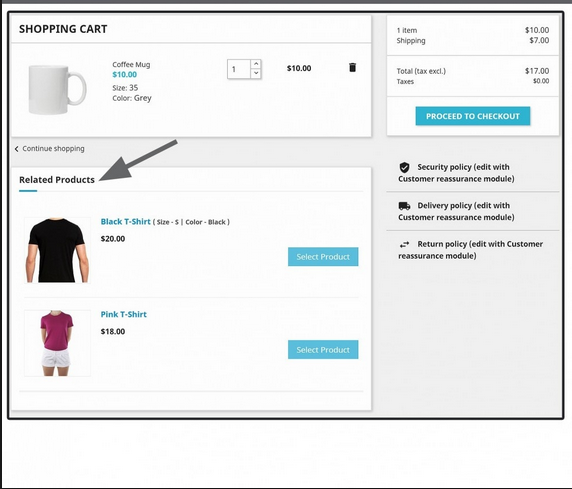 Increase sales of lesser-known products is the perfect opportunity to show some items that have in the catalog but are less popular.